The oldest evidence of human occupation in the region that we today call Costa Rica show that nomadic groups of hunter-gatherers arrived after 10,000 BC. They lived in family-based groups of 20-30 people and hunted megafauna animals such as mastodons and giant armadillos, which became extinct around 8,000 BC. Very old evidence of stone tool making has been found at the archaeological sites Guardiria and Florence in Costa Rica’s Turrialba Valley. Both spearheads of a type commonly associated with the Clovis people of North America and arrows of a South American style have been uncovered here, indicating that they region has probably been a place influenced both from the north and the south. We don’t know exactly when people in Costa Rica first began farming for food, but we do know that settled (non-nomadic) farming communities existed here by the second millennium BC. The period between 300 BC and 300 AD was an era of immense change in Costa Rica, as many communities moved from a tribal existence where each group was more or less self-sustaining to more complex and hierarchical living conditions. This is when we see caciques (chiefs) emerge and trading between groups become more widespread. Some individuals stop working directly with the procurement of food and instead become specialist professionals, e.g. artisans. From the 9th century AD, we can see that some villages are growing big. In Pre-Colombian times, the people living in what is now Costa Rica lived between two major cultural regions: the Mesoamerican to the north and the Andean to the south. When the Spaniards first arrived in the 16th century, the Nicoya Peninsula was the southernmost extreme of the Nahuatl sphere of cultural influence. The regions that today form the central and southern part of Costa Rica were influenced by Muisca. One of the populations in pre-Columbian Costa Rica that we know the most about is the Diquis culture. 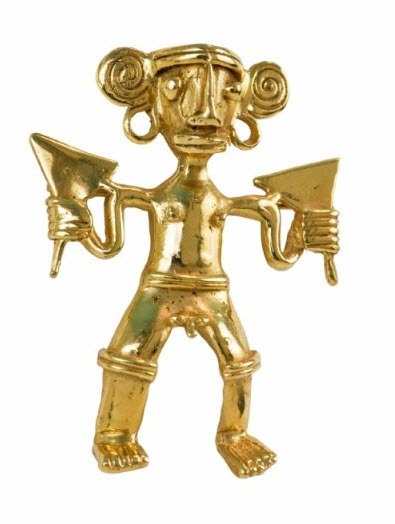 This culture, which flourished from 700 AD to 1530 AD, was a part of the Greater Chiriqui culture that existed from southern Costa Rica to western Panama. In the Boruca language, Diquis means “great waters”. The Diquis created stone spheres and over three hundred such “stone balls” have been found in the Diquis Delta and on Isla del Isla del Caño. In 2014, the Precolumbian Chiefdom Settlements with Diquis stone spheres were added to the UNESCO list of World Heritage Sites.